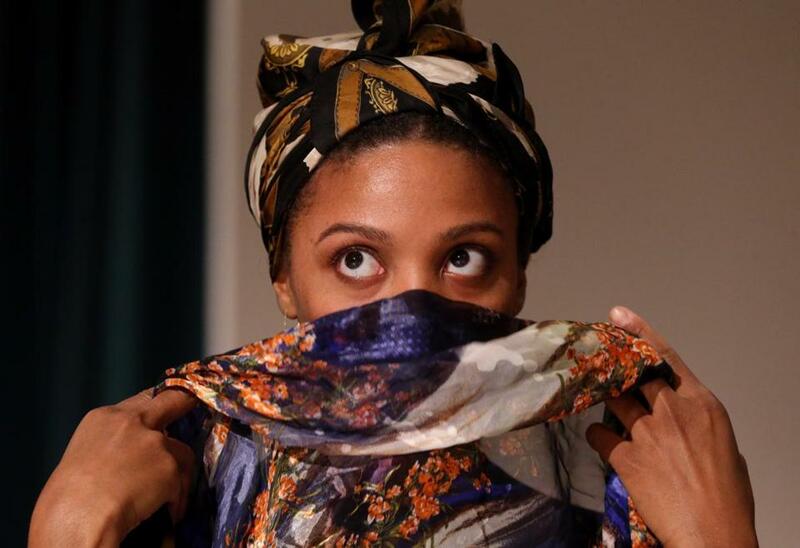 Jade Wheeler, shown during rehearsal, stars as Eartha Kitt in “Who is Eartha Mae?” at the Multicultural Arts Center in Cambridge. Eartha Kitt may be best remembered for her sultry rendition of the holiday chestnut “Santa Baby” and her performance as Catwoman in the campy ’60s TV show “Batman,” but writer and performer Jade Wheeler wants you to know those were just a few of the many identities the performer created for herself. “Everything about her stage persona was carefully constructed to please her audiences,” says Wheeler, whose one-woman play, “Who is Eartha Mae?,” is having its world premiere at Bridge Repertory Theater. The show runs Jan. 31-Feb. 23 at the Multicultural Arts Center in Cambridge. “I wanted to know who the woman was behind the glitz and the glam,” she says. Wheeler, who has appeared in the Nora Theatre Company’s production of “Arcadia” and Bridge Rep’s sensational “Dark Room,” put together a piece on Kitt that won best cabaret act at the United Solo Festival in 2016. When Bridge Rep’s producing artistic director Olivia D’Ambrosio expressed interest in staging a full production, Wheeler reworked the script and collaborated with director Cailin Doran and music director/pianist Seulah Noh on the song and scene selection. Doran says Wheeler has become an Eartha Kitt scholar, studying the many interviews and videos of her performances to capture her inflections and gestures in this slice-of-life play with music. “Who is Eartha Mae?” opens in a dressing room after a performance and moves back and forth, onstage and off, with Kitt sharing memories from her life. “I became fascinated by the way she shifts in between these two dualities: the star onstage alone under the lights, and then alone and isolated back in her dressing room,” says Wheeler. Kitt had a harrowing childhood, abandoned by her mother, abused by other family members, but once she was accepted to the Katherine Dunham Company, the renowned African-American modern dance company, she never looked back. After a few years with the company, she began performing on her own in nightclubs, gaining acclaim on TV and in films. But after speaking out against the Vietnam War at a White House luncheon hosted by Lady Bird Johnson in 1968, her roles became scarce. Kitt spent several years touring Europe before reviving her career in the United States, which led to more Tony nominations and an Emmy. She died in 2008 at the age of 81. Imaginary Beasts’ Winter Panto returns for its 16th annual performance of this family-friendly take on the Victorian tradition, running through Feb. 10 at the Charlestown Working Theater. “Paul Bunyan and the Winter of the Blue Snow” features actress Kiki Samko as Bunyan, who is lonely on his trek into the mountains until he meets a band of misfits who become his companions, including Babe the Blue Ox and a trusty dog named Niagara. Artistic director Matthew Woods and the Imaginary Beasts’ ensemble develop a unique retelling of the Paul Bunyan legend to fit the traditional English panto style, complete with comic wordplay, gender-bending casting, pop culture references, and lots of opportunities for audience participation. In the Imaginary Beasts’ version, King Zero (a.k.a. Old Man Winter) wants to destroy Bunyan’s legend and keep winter going all year round. The reimagining of the American folk tale follows last year’s offbeat version of “20,000 Leagues Under the Sea,” which took the basic premise of Captain Nemo and his submarine but used it as a frame for some delightful storytelling, comic vaudeville-style antics, and celebration of the magic of theater. For tickets, go to www.imaginarybeasts.org. The Theater Offensive kicks off its 30th anniversary year with an event in City Hall at noon on Monday, featuring artists, city officials, and community members, as well as performances by Billy Dean Thomas and Neon Calypso. Founded by director Abe Rybeck, the Theater Offensive is Boston’s longest-running LGBTQ theater company, showcasing many queer artists who went on to national reputations (including Lisa Kron and Luis Alfaro) as well as launching True Colors: Out Youth Theater, which received the National Arts & Humanities Youth Program award. “The work the Theater Offensive has done over the past 30 years truly embodies the transformative power of the arts, and the ability to inspire and empower communities through creative expression,” Mayor Marty Walsh said in a statement. An exhibit chronicling key moments in the Theater Offensive’s history will be on display in the City Hall mezzanine through Jan. 31. Productions and other events celebrating the 30th anniversary will be announced later. Terry Byrne can be reached at trbyrne@aol.com.